Thank you so much Dr. Afifi! I love seeing you at the office and love what you've done for me! Thanks for all your excellent care. I am thrilled with the results! I researched you so thoroughly before my procedures and am extremely glad you are my surgeon...I plan to visit you again when I have more procedures done and have recommended you to to my friends. Thanks again!!! Thank you so very much for adjusting your schedule to accomodate my urgency. You have allowed me to better enjoy my senior years (smiles). I am very pleased. Words cannot express my gratefulness. Thank you and may you continue enjoying success. Thanks for doing such a great job! You are the the best! All my referrals will be to you! Thank you so very much! Thank you for all you have done. Melani thinks the world of you and now I know why. Happy Birthday to a talented doctor who always goes the extra mile and to a very special individual. Thank you for being such an inspiration! Thank you so very much for helping me with the skin surgery and the visits. I am grateful that you could help me so that I could be taken care of in a timely manner. Just a note to thank you for your kindness. I cannot begin to thank you enough for my wonderful lips! I am thrilled beyond words. You are such a dear to have taken such great care of me! Thank you so much for taking care of us! You are such an incredible and talented surgeon! It's not just that you do things - it's the wonderful way you do them. Thank you so much for being so kind and such a great doctor. There are doctors and then there are DOCTORS. You're the best. There is not enough words in the dictionary to describe how I feel bout Dr. Afifi she is the BEST! I come to her knowing I will get exactly what I ask for. She gives me the confidence I never had, so caring and straightforward. Did I mention she is the best?! Lol Tammy and Maria are super friendly and honest I totally feel comfortable being there. I highly recommend anyone and everyone. Thorough and diligent. Wants results to be as natural as possible and won't do anything that is not in the best interests of her clients. Truly the tops in professionalism. Great staff also! She is very thorough, precise and helpful. Simply outstanding. I rarely have questions for her because she addresses most of all my concerns before I even ask, in a way that is not overwhelming. Then when I do have a question, she answers with a complete response that does not leave you wondering more. There's a way about her that brings you comfort and trust that she is far more than capable. I am glad I chose Dr. Afifi. She helps you obtain what you want, striving for perfection every time and achieves it. She is truly a wonderful doctor! She made me feel so comfortable and in good hands. I couldn't be happier with my results. Most of all, I couldn't be happier with the way I feel. Thank you to and your staff. 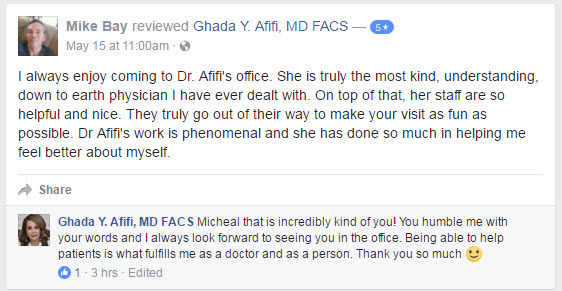 Dr. Afifi is wonderful! She is straight forward and honest about what to expect during and from all procedures...I trust her Completely!